It’s 2016. The Australian restaurant industry is worth $13.1 billion, Menulog delivers its 22 millionth meal and Deliveroo cyclists are everywhere. How do you reinforce market leadership against hungry rivals? 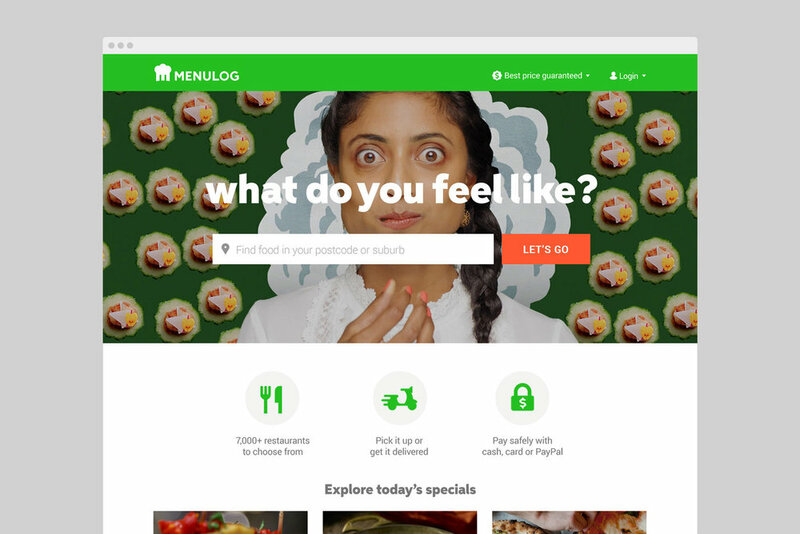 When Menulog was founded in 2006, it was Australia’s first aggregated food delivery service. By 2015 it had grown to encompass over 70,000 restaurant partners across Australia. However as new competitors and evolving technologies dramatically altered the operating environment, Menulog’s advantage was beginning to erode. Re was called upon to rethink the brand for the digital future. A new face for an old favourite. For the logo, our aim was to retain the equity that already existed in the chef's hat and green, yet modernize the mark to be more modern and digitally savvy. Our solution was to separate the chefs hat as a symbol that can be used as an app icon or shorthand logo. As an added the chefs hat is drawn to also read as an 'm'. Designing for a mobile-centric world. When Menlog first launched, most people accessed the internet from a desktop computer. As a result, the brand lacked the strength and simplicity required to respond to a mobile-centric world, particularly when compared to its newer rivals. To bring the brand up to date, Re crafted the Menulog chef’s hat into a simpler icon, incorporating an ‘m’ to ensure the name is always represented. A suite of custom icons was then created to guide people through the ordering process. Based on the geometry of the logo, these icons deliver functionality and personality in equal measure. Menulog’s signature green was freshened to not only make the icon more prominent, but help drive a shift in user mindset. Currently, ordering takeaway from a mobile device is still a relatively new concept in Australia. The updated Menulog icon helps normalise this behaviour, as it sits naturally next to the green spectrum of app icons we use on a daily basis for our most personal interactions – Phone, Messages, WhatsApp. One of Menulog’s key differentiators is the choice it offers customers. To launch the brand, Re developed the positioning ‘Making Food Delightfully Personal’. This positioning drove a campaign, created in collaboration with M&C Saatchi, that brought to life the deeply personal nature of what we eat.